This is a map of the outdoor murals in the Staten Island Art District along the North Shore of Staten Island in New York City. It covers from Snug Harbor Cultural Center to Fort Wadsworth, focusing on Bay St. and Richmond Terrace. It is a work in progress. This map and this site will evolve along with the rapidly growing public art movement on SI. The image above can be downloaded to a phone for access without internet. Photos of all the murals on this map are located in the North Shore Map section of this site. This map is revised as of the date printed on it; it is also just a guide, come find all the hidden gems throughout the streets of Staten Island. The idea for this map came about when SI artist Kwue Molly took note of all the highly visible, but widely overlooked murals near his home along Bay St. Dozens of artists have contributed individually to make this 4 mile stretch a vast canvas for all different styles and genres of art. 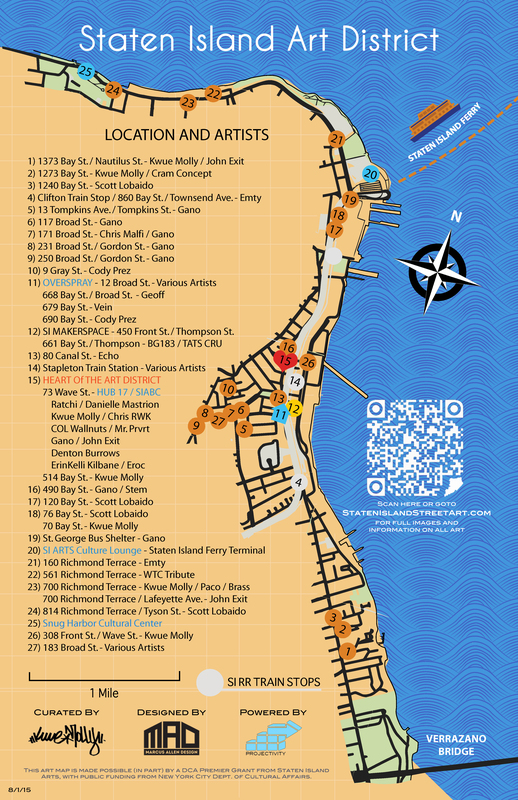 It only made sense to create some kind of guide to showcase all the artwork in the area. Kwue teamed up with Projectivity and received a grant from SI Arts to develop a map. After taking photographs and developing the idea more, they worked with graphic designer Marcus Allen to develop the downloadable map available today. This is an ongoing project, and will be updated as more murals go up in the area. The StatenIslandStreetArt.com website will also grow with more interviews, articles, pictures, videos, event listings and more info on the enormous art scene that is all over Staten Island. Stay tuned.